Today I had the pleasure of taking a walking tour of Medellin after my host at the house I am staying at recommended a good one. I looked up the recommended tour online and after reading through their website I liked what I saw and decided to give them a try; after all, the tour was free so how could I resist the freebie? tips were welcome though. The tour lasted for four hours and it covered some history and culture of the city. The guide was knowledgeable and had a good personality so it made for an interesting time. I like walking tours because they are a good introduction to a city and give you an idea of what you may want to see more off, later on by yourself. Whenever I land in a new city I like checking out if there is any walking tour being offered just so that I can get a clue as to what activities or sites I may be interested in when I venture out by myself. 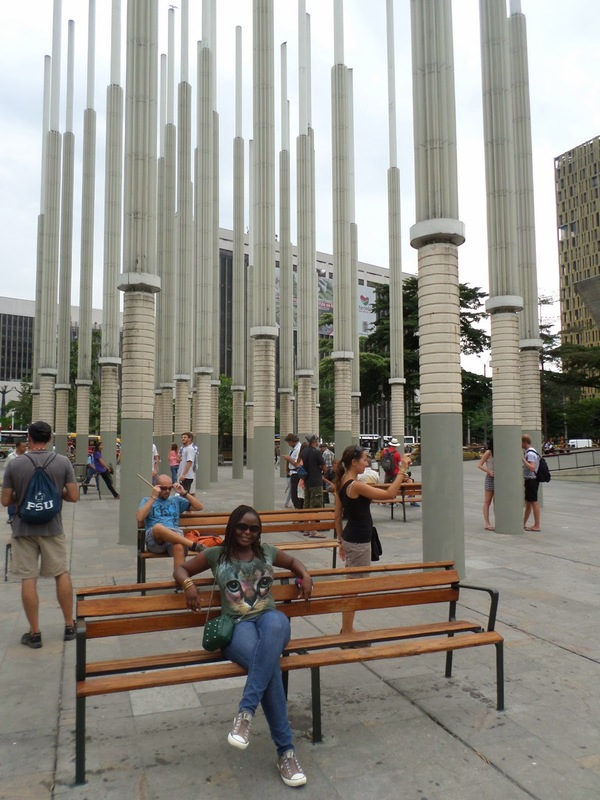 Here is an introduction to Medellin.........enjoy! PS: It was an overcast day so that is why the pictures appear darker, better than nothing right? Check out how packed downtown usually is. I love it! This is an old building that had been converted into a shopping mall. It was very pretty inside. Apparently Medellin is the capital of cosmetic surgery in Latin America, some women have payment plans that last for years because of work done on their bodies. The mannequins in Medellin give you a clue as what the "ideal" body image is over here. If you thought the mannequins in Cali were packing............you should see the ones in Medellin! ridiculous. The Spanish school I attend in Medellin is full of good looking people starting with the teachers. First time I went for my classes i was wondering if I was in a modeling school instead. And on that note, the downside of my rental arrangement is that I have to share a bathroom with strangers. Medellin has a lot of foreigners and it seems like the foreign guys here are enamored by girls from Medellin, they sure don't waste time in getting local girlfriends. I still haven't had the opportunity to enjoy the nightlife in Medellin but I hope I will do so before I leave next week.